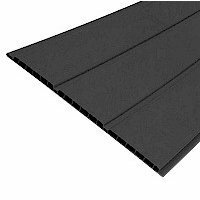 The Dark Grey uPVC Hollow Soffit is a versatile product that can be laid vertically or horizontally depending on preference. Becoming increasingly popular with UK homeowners due to the unique tongue and groove effect. This easy to install soffit will ensure an impressive update to your property. All products comes in 5 metre lengths. Foiled hollow soffit boards are woodgrained, a lookalike wood style finish. Standard smooth finishes are available in White, Dark Grey, Slate Grey, Black and Cream. Manufacturer: Homeline RAL Colour: 7016 Product Length: 5m Product Width: 300mm Product.. Dark Grey 5m External Trim.. Manufacturer: Homeline Product Length: 5m Accreditations: BSI Approved Guarantees: 15 years.. Dark Grey 30mm fixing pins for used with Dark Grey flatboards/soffits Average contents of box 250.. Dark Grey 65mm pins for fixing 17mm Dark Grey Fascias Boards Average box contains 100 ..